This year’s group of candidates, along with the RRDC’s John Fergus (left) and Team USA Scholarship founder Jeremy Shaw (second from right). From the time I was only 4 years old I was absolutely sure this is what I wanted to be when I was older. Of course, at that point, I had no idea where exactly it would take me but now looking back 14 years later I would not change a single thing. Year to year, my progress has exceeded even my own expectations and I couldn’t be happier with the position I am in currently. This past year has most definitely been the greatest of them all. It has been the toughest 12 months but no doubt the most rewarding! Through this past year I have met and became close with some of the greatest names in the sport. It has been truly inspiring, and ALL the credit has to go to the Team USA Scholarship. I can’t even begin to explain the amount of knowledge I have gained from everyone involved. It is truly remarkable. One year ago, I was first nominated for the Team USA Scholarship and attended the interview portion against some of the top up-and-coming talents in the USA of 2016. At that time I really didn’t know how to handle it. There were so many of the top names in motorsports analyzing me in every way; I was honestly star-struck! Fortunately, everyone admired me enough to put me through to the final six. Becoming an IndyCar driver is my goal. Now, I have been nominated for the Team USA Scholarship for a second time. I was informed of this just after the great weekend Cape Motorsports and I had at Canadian Tire Motorsports Park, where we swept the weekend with three wins in the F4 US Championship Powered by Honda. It is very humbling to have an opportunity to represent the red, white and blue not only one time but possibly two times in a row. 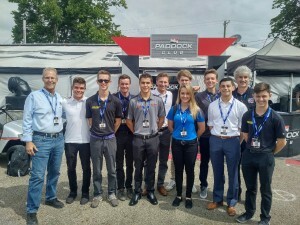 Last weekend, myself and the other nine contestants traveled to the renowned Mid-Ohio Sports Car Course for the Honda Indy 200, where the interview process took place once again. It never ceases to amaze me how many doors Jeremy Shaw can open for us. He scheduled us with exclusive tours of a couple of Pirelli World Challenge teams – K-Pax/Flying Lizard with Bryan Sellers and Wright Motorsports with factory Porsche driver Patrick Long – plus IndyCar Race Control and Chevrolet’s development and data stations. 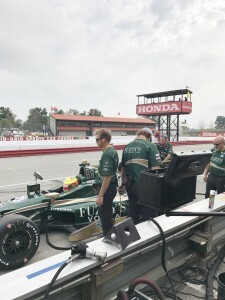 In addition, we were able to sit-in with a few Verizon IndyCar Series teams during practice, such as Dale Coyne Racing, Ed Carpenter Racing and Chip Ganassi Racing. This made for a very full day. 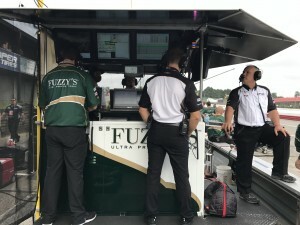 I’m always stunned with how high-tech the IndyCar teams are — almost every piece of the car is being analyzed live by someone in the pit-box. Thanks to INDYCAR Race Director Brian Barnhart, we have a much better understanding of how the races are run! This year, for me, the interview process was quite different – mainly because last year I knew almost nobody and now, with the networking I have had in the past year, I knew all of the judges and had actually developed a close relationship with a few of them. I would have to say this year wasn’t as nerve racking, despite the fact I had more weight on my shoulders considering I am a second-year contestant. Overall, I really could not ask for a better weekend than that. It’s always great having the opportunity to be at a race track, even if I’m not racing. Soaking up the atmosphere and seeing how close and team–oriented motorsports is, motivates me like nothing else. Now, for me, I have one week to prepare for my next F4 US Championship event, coincidentally at the Mid-Ohio Sports Car Course.